The City of Houston is one of a few municipalities across the country with this requirement for both Domestic and Fire Water Pumps. The tank air gap effectively separates the building's water supply and consumption from the city water lines. This should stop any contamination from a building getting back into the city supply and affecting others. Also, large sudden demands in a building (i.e., fire pumps) shouldn’t affect the water supply to those around it. While a tank is an effective backflow prevention method, it does add some complications. Tank size and design, water-level controls, pump pressure design calculations and system maintenance all must be considered when using a storage tank. The National Fire Protection Association (NFPA) Standard 22 has requirements or Fire Water Storage tank sizes. However, there is no minimum tank size for domestic water. There are multiple options for tank construction. Steel tanks with coatings for potable water are widely used, but over time maintenance on steel tanks and coatings can be expensive and time-consuming. Alternatives to steel are fiberglass and plastic, both of which carry NSF61 ratings without the need for coatings. 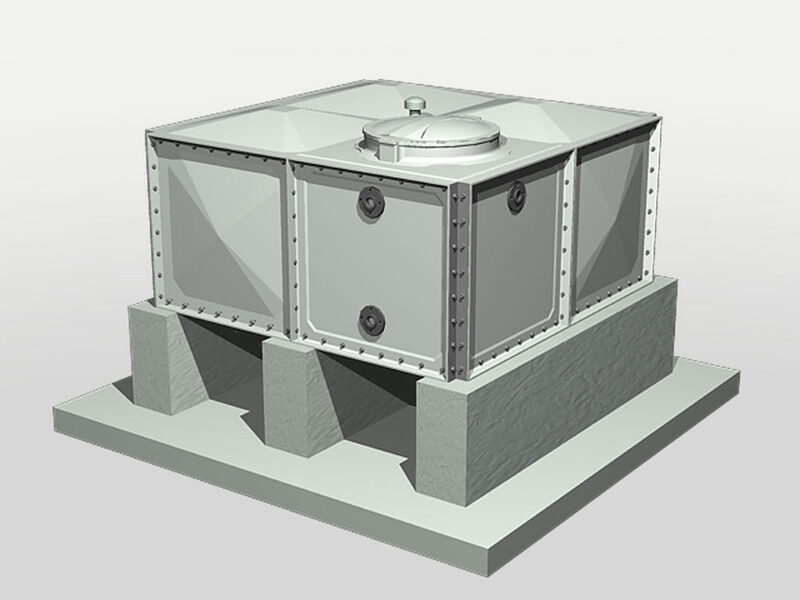 The modular design of the FTC FRP Tank is ideal for tight space requirements of most pump rooms. In order to maintain a constant water level in the storage tank, fill valves and controls must be used. A simple method is to use a Float Valve on top of the tank. For more control, electronic valves and a control panel are used. A quality level-control system can prevent tank overflows and flooding or dry tanks and the building losing water. It is crucial that the building management system monitor the level-control alarms for potential issues. When using an atmospheric storage tank, the city supply pressure cannot be used in the booster pump pressure calculations; this is referred to as Flooded Suction as opposed to Pressurized Suction. Pump selections must also consider the low Net Positive Suction Head provided by the atmospheric tank. The Grundfos CR Multi-Stage Pump is an ideal selection for Flooded Suction pressure-boosting applications. Cougar USA has worked in hundreds of buildings in Houston with storage tanks, level controls and booster systems. For more information or a free building assessment, contact us here.